Aluminum Business. Not much aluminum, but big stability anyhow. 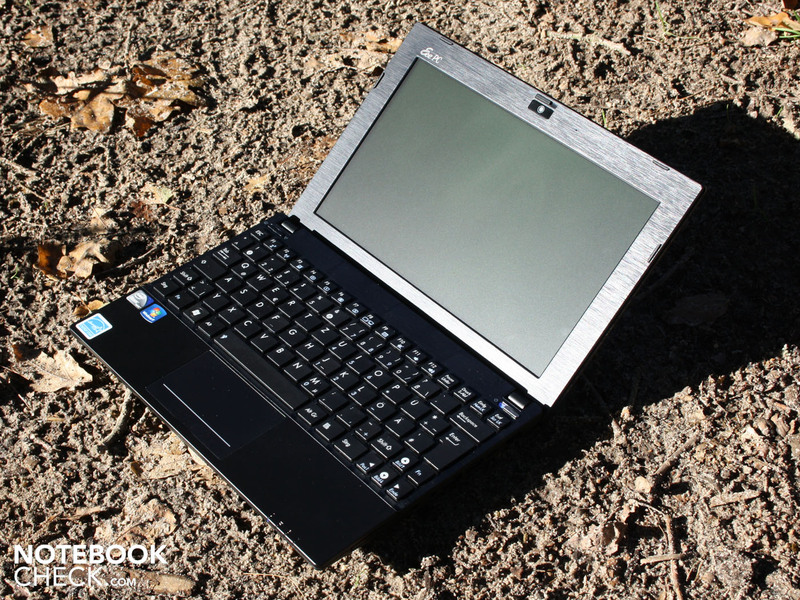 Find out why the 1016P with a two gigabyte DDR3 and a matt, contrast rich display almost turns out to be the perfect netbook. 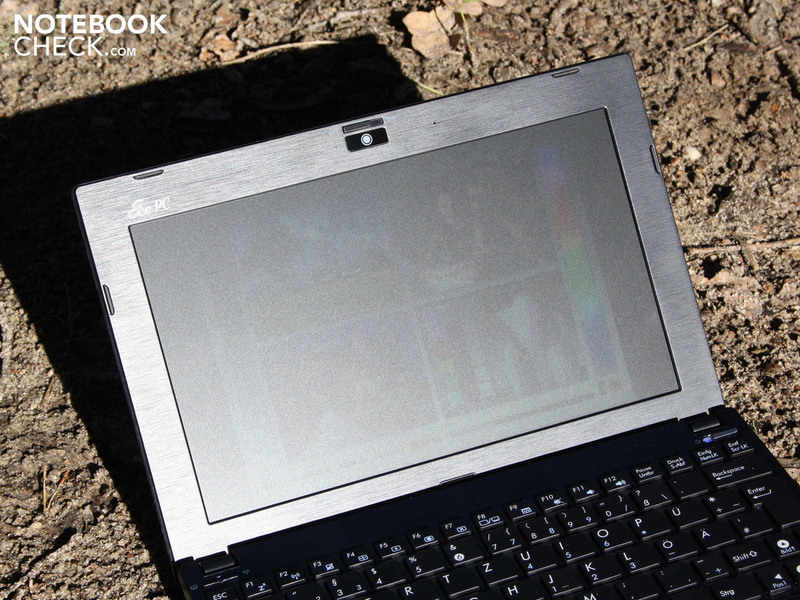 Netbooks can also be useful for the zealous professional user. Small, easy to stow equipment for checking emails, making presentations and entering data. Because they are sufficiently robust, the 10 inchers usually don't even need a case and disappear quickly in hand luggage. 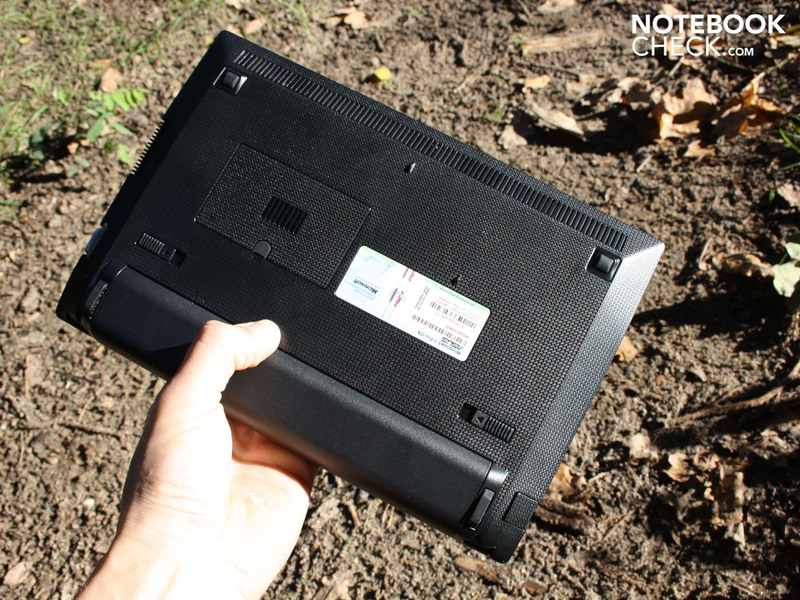 Asus isn't the first manufacturer to launch a separate netbook model for business clients. Samsung has done this quite successfully with the N220, respectively the N230. HP has its Mini 5103 (not yet available) and its Compaq Mini 110-3001sg. And even Acer had introduced its Aspire One Pro 531 at the end of 2009. Not only the interested business user, but the demanding consumer could take a liking to the functional looks, the matt displays and the technical features (UMTS partly installed, battery life). 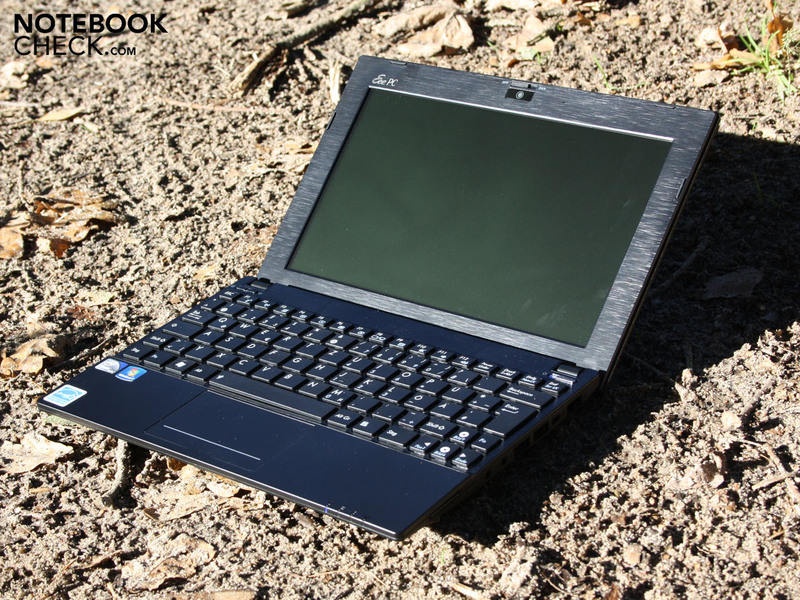 In this review, we'll examine if Asus' Eee PC 1016P-BLK027F (Win7 Professional) can successfully join the league of business minis. The 10.1 incher has to accept high expectations at a price of 435 euro. The 1016P's case is relatively thin, especially in the front. The wedge shape, decreasing towards the front, is particularly distinct. The obvious slant towards the lower right and left edge provides grip when the device is picked up from the desk. Thus, you can slide your fingers underneath the 10 incher to pick it up. Materials and feel are overall high-end, but still radiate a certain plastic charm. But where are the aluminum applications that have always been mentioned when speaking of the Aluminum PC (see Eee PC 1018P)? It's merely the black coated keyboard bezel that has been made of brushed aluminum. This plate is part of the base unit and not just a key frame. This makes the keys protruding out of the case to an integral part. The base unit receives a very good stiffness. The base plate is made of structured plastic that nevertheless has a smooth feel. The wrist-rest is mounted separately and constructed of a smooth, matt and hard plastic. The lid's surface looks like brushed aluminum (black), but it is plastic with the corresponding structure. The surfaces feel pleasantly matt and don't leave many fingerprints. 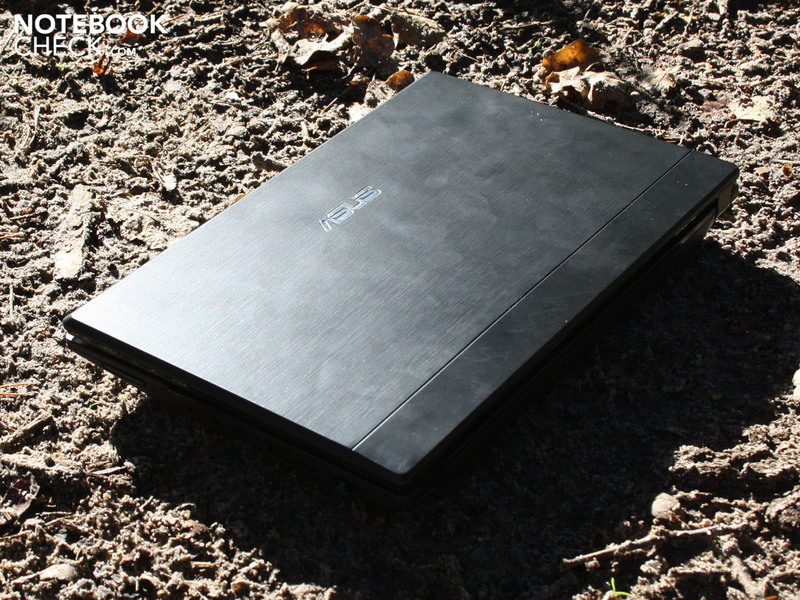 The silver Asus logo is embedded in the plastic and can be felt tactilely. The thick, but in return, very solid lid with a surface resistant to medium pressure is especially pleasing. Pressure applied with a finger can't dent the 1016P's bottom, either. Only the RAM cover yields slightly. The case even remains stable when we remove the 6 cell battery. The hinges are stiff and we need both hands for opening. The high force with which the lid and base unit stay closed prevents objects from sliding in during transportation in a case or backpack. The maximum opening angle of circa 130 degrees isn't particularly wide, but sufficient to look at the display comfortably on scheduled flights. 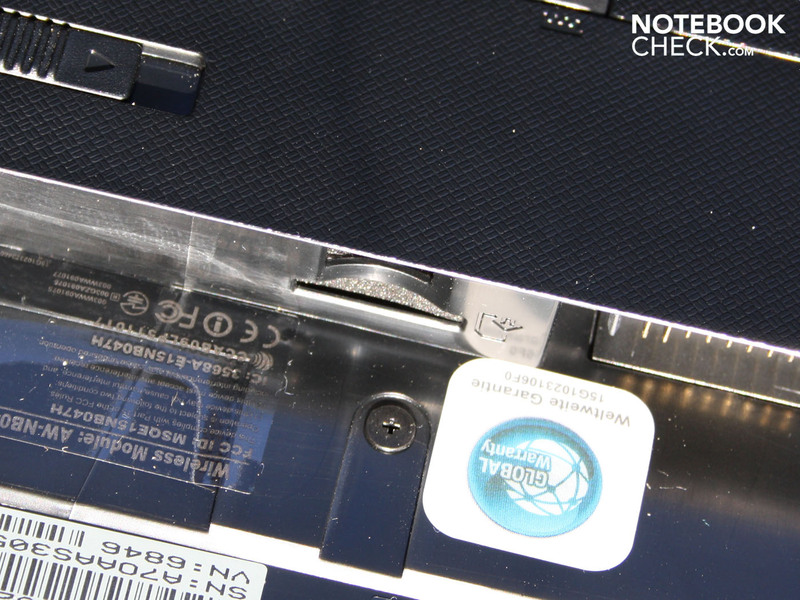 The connections only provide the narrow netbook standard. We find the hinged Ethernet port on the right, in the vicinity of the Kensington lock. 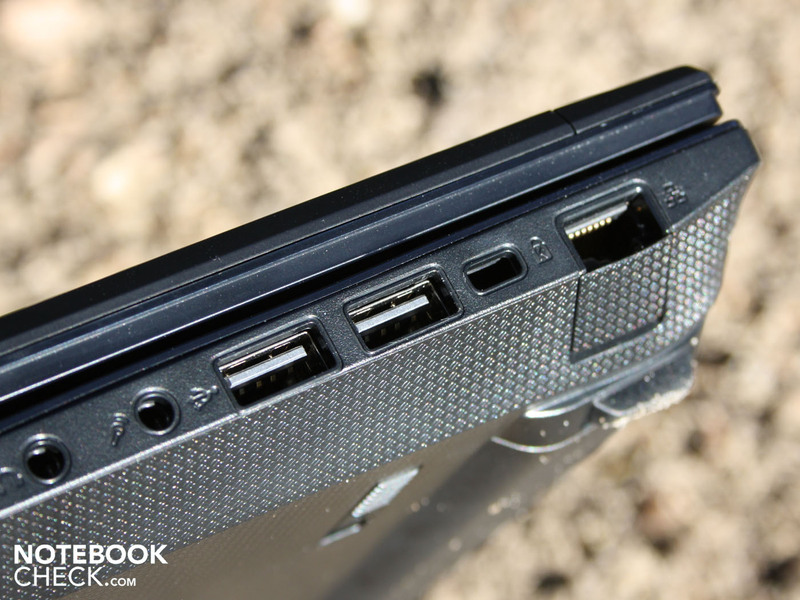 A cardreader, as well as a headphone and microphone socket finish off this side at the front. There are also two USB 2.0 ports here. The case's left only supplies a VGA jack and a USB port. The rear and front are completely unoccupied. The VGA webcam unfortunately doesn't comply with the quality claim. It can only take pictures with 0.3 megapixels and also does that in a very poor quality (320x340 pixels, color cast). We've made two sample pictures. The noise in the picture is fairly intense, especially in weak daylight coming through a window. The colors look pallid and unnatural. The security-conscious user will like the webcam's mechanical cover. Anyone who might ever hack the PC won't be able to spy on the owner via webcam. 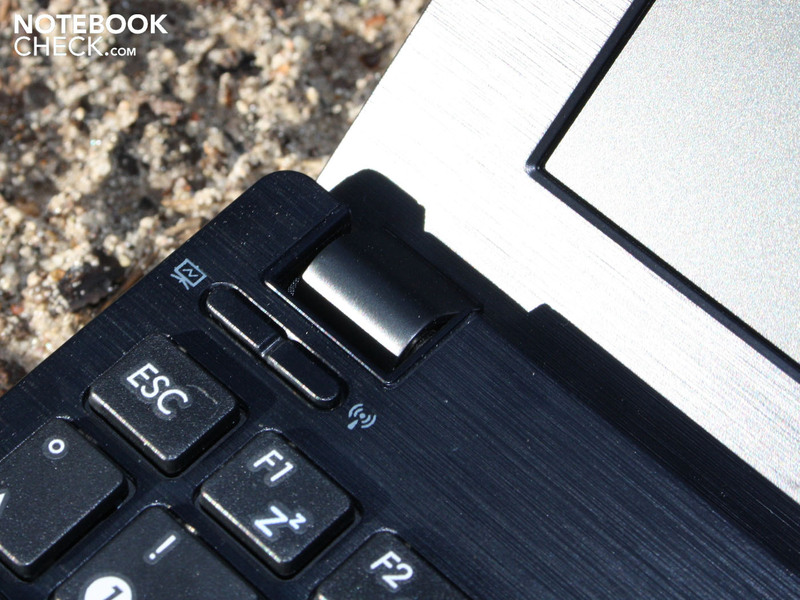 The Bluetooth module for wireless connections with mobiles or inputs is mandatory for the business netbook. The new 3.0+HDR standard is used. A connection to the home and company network can be built-up via cable (Ethernet, gigabit LAN) or via wireless LAN (draft-n). There is only the preparation (SIM card slot) for an internal HSDPA module underneath the battery of our test device. Thus, we had to execute our 3G runtime test with a UMTS stick. The 1016P lacks any security features like TPM or hard disk encryption. It's been placed one price category too low for that. Syncables Desktop is a tool that synchronizes files, emails and contact between computers and mobile devices. There are no DVDs included. You have to secure Windows 7 Professional via PowerRecover on your own. In opposition to the consumer models, Asus grants a 24 month manufacturer's warranty on the Eee 1016P. 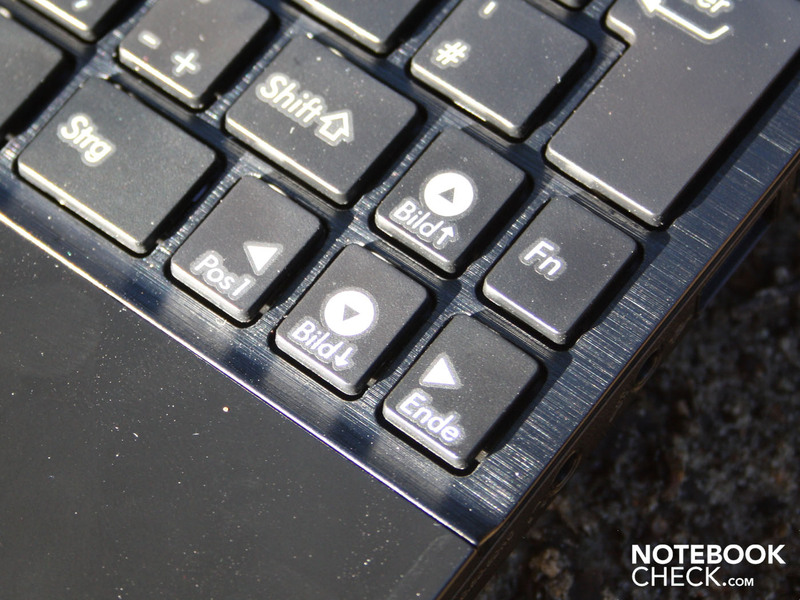 Apart from the inevitably small keys, the 10.1 incher has a keyboard with a strong feedback. We don't want to claim it's feasible for prolific typists. The right keys are too minute and crowded for that (shift, arrow keys, hyphen). Typos will be the order of the day for big hands. 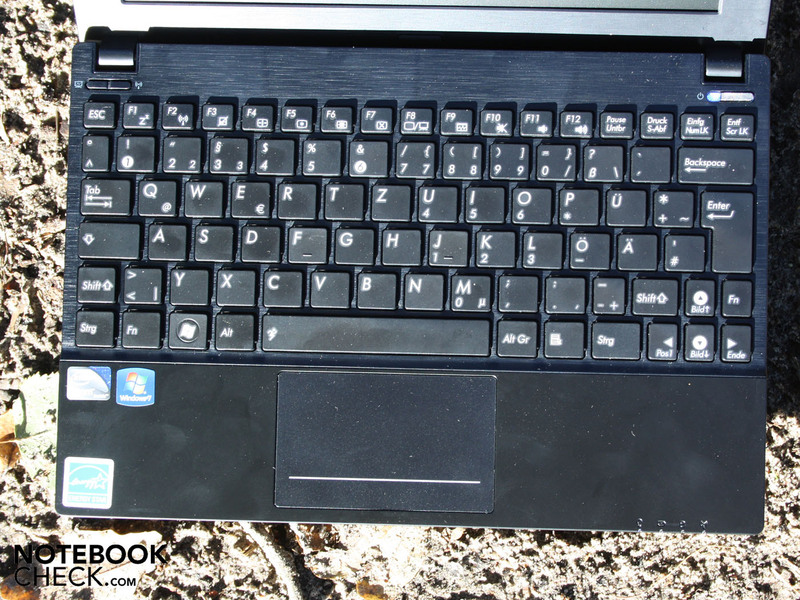 We see the keyboard's advantages in the clear stroke length, the crisp pressure point and the firm stroke. The entire input surface doesn't yield anywhere. Unfortunately, the touch typing markings on F and J aren't easy to find. The multi-touchpad from Elan (V7.0) has many settings for individualization. The multi-touch functions (gesture control) can be manipulated with it. Regrettably, we did not find a possibility to activate the horizontal and vertical scroll bar. Thus, conservative users will have to get used to scrolling with two fingers. The surface is relatively smooth and can only be discriminated from the wrist-rest by a narrow rim. Due to this, fingers sometimes can end up outside of the pad in hectic situations. The submerged mouse keys with a short stroke length are unfortunately a drawback for fast operating. The lower, hard edge is disturbing when tapping, especially if you tap with the thumb placed on it. The pressure point is alright, but the feedback is highly unsatisfying due to the very short stroke length. The native resolution of 1024x600 pixels (WSVGA) is netbook standard and inadequate for a business device. The overview on the display is simply too cramped. Small pop-ups already obstruct the entire window. Thus, a lot of patience is needed for viewing complex websites or applications. Asus, however, bids the user relief in the way of interpolation. The display resolution can be set to 1152x864 or 1024x768 pixels. Consequently, the need for scrolling in documents and on websites is reduced. The more or less intensely distorted image isn't pretty - but at least an almost complete notebookcheck homepage fits on the display horizontally then. The matt display's surprisingly high contrast is beyond netbook standard. We assessed 835:1 at the maximum brightness of 259cd/m2 (center). Does the screen perhaps cover the sRGB color space? The test with the colorimeter quickly brings disillusionment: A higher black value doesn't have anything to do with color space coverage. 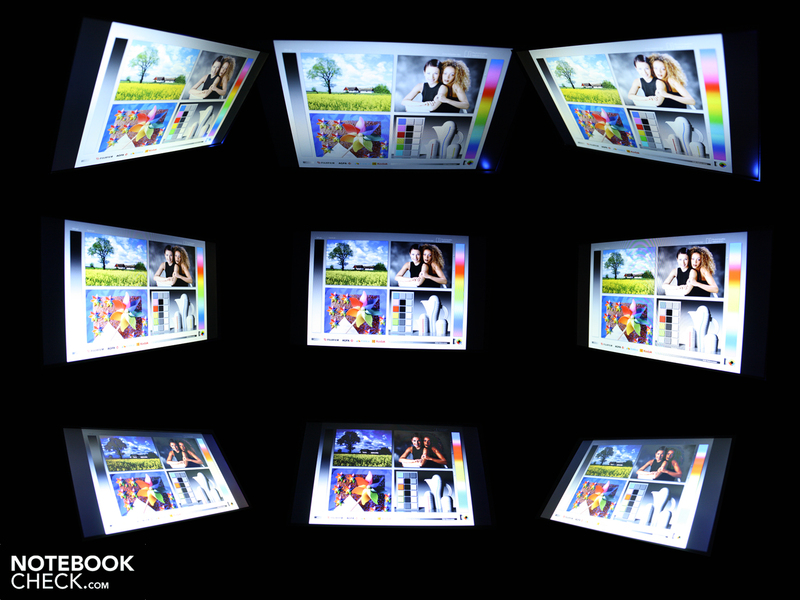 The graphs show that our screen can only just cover about the half of the sRGB color space. It looks even a lot worse with Adobe 1998. Even a midrange business laptop with a run-of-the-mill screen, like HP's 6555B, has a wider color space (grid = HP 6555b). The display brightness is agreeably high. The lux meter measures a maximum of 259 cd/m2. This is still a good average of 249.6 cd/m2, which is a scarcely reached high rate. Its rating is increased by its homogeneous illumination of 94%. Especially bright displays typically have the most uneven background illumination. 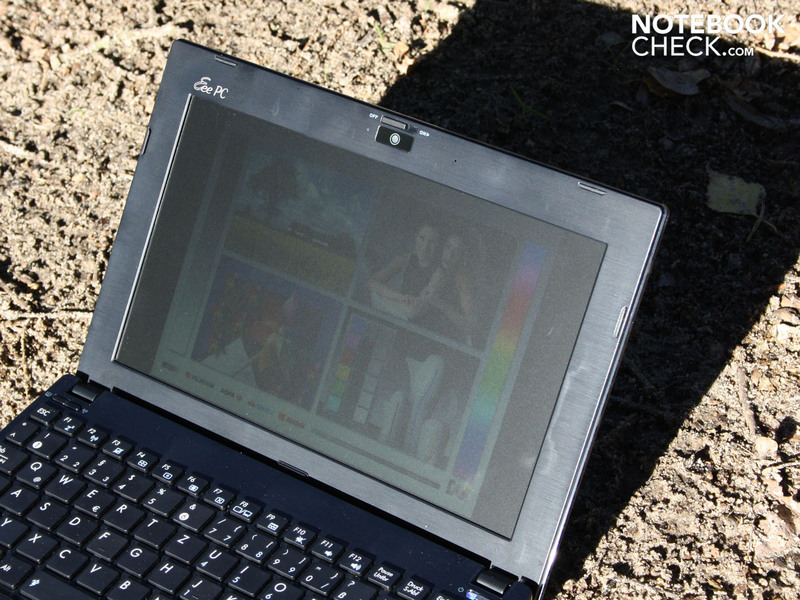 The unfortunately not measurable Eee PC 1016P screen is an exception to the rule. The matt TFT's brightness is truly one of the strengths in outdoor use. Direct sunlight can only prevent us from seeing the image in certain, unfavorable angles. We see such a clear image in indirect light - that is lateral sun incidence - as if we are in the office. There are no reflections whatsoever because of the AR coating. 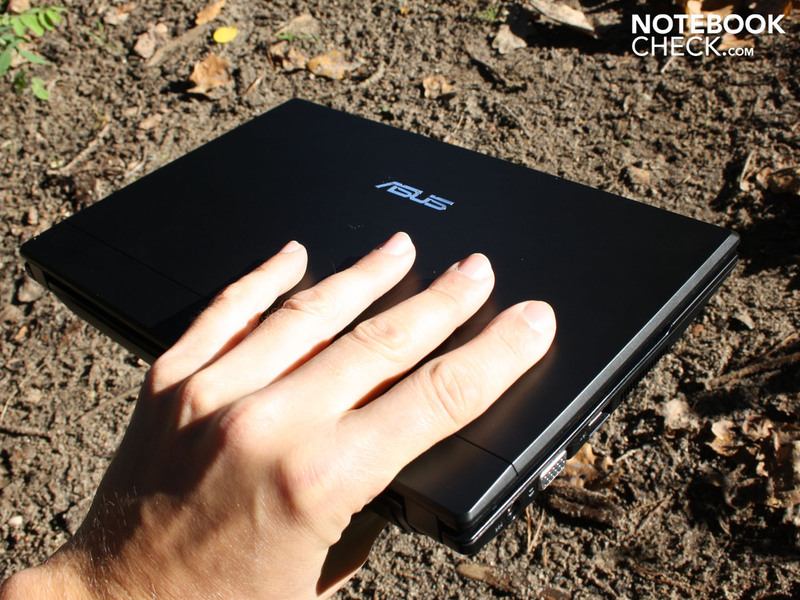 The Asus mini's viewing angles also provide plus points. Our eyes can stray up to almost 90 degrees on the horizontal plane. Colors stay stable and only dim. Our view can only deviate approximately 20 degrees downwards or upwards on the vertical plane. Then the image dims evidently and colors invert. 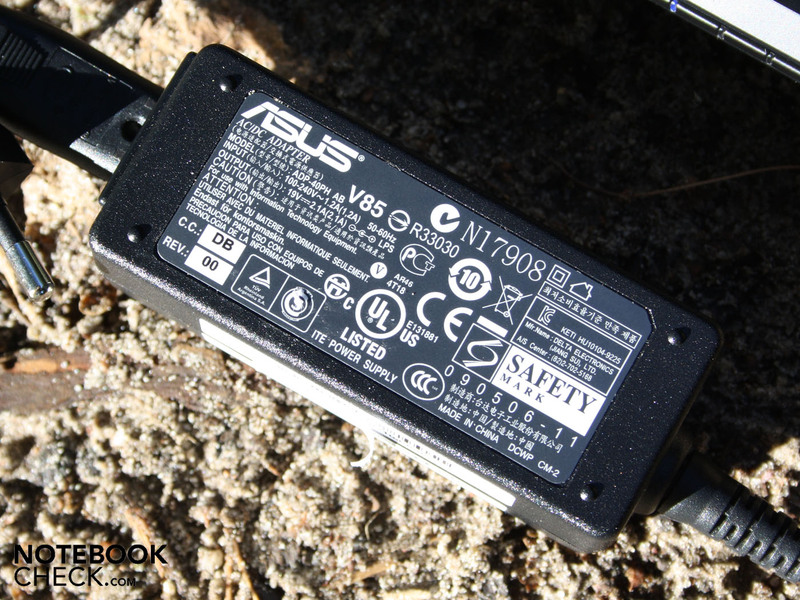 The Asus 1016P is based on an Intel Atom N455 processor (1x1.66 GHz, FSB 667 MHz) with an integrated GMA 3150 graphics. The processor has a small L2 cache of merely 512 KB. Intel's hyper-threading (HT) provides applications with a second, virtual core. Thus, the single-core processor can manage Windows 7 despite the in-order architecture. The TDP is a low 5.5 watts and already includes the memory controller for DDR2 and DDR3, as well as the GMA 3150. By the way, the DDR3 support is the only difference to the often used Atom N450. The processor is supported by a DDR3 RAM of 2048 MB and a hard disk of 250 GB from Seagate (ST9250315AS, 5.400 rpm). The DirectX 9 GPU, GMA 3150, is incorporated in the processor and contributes extremely little in the 3D benchmarks. For example, 3DMark2006 finishes with 149 points. In comparison, starter gaming notebooks with relatively weak game graphic cards reach 5000 to 6500 points. There is no HD support from the GMA 3150. High resolution videos partly can't be played smoothly. The N455 has a hard time with a 720p WM9 file. The trailer runs just smooth, though (72% load, 1152x864). However, the 1080p trailer (full screen 1152x864) was only played unsmooth (100% load). The system ran in Super Performance Mode (rate 1.7 GHz) and at the mains for this little test. 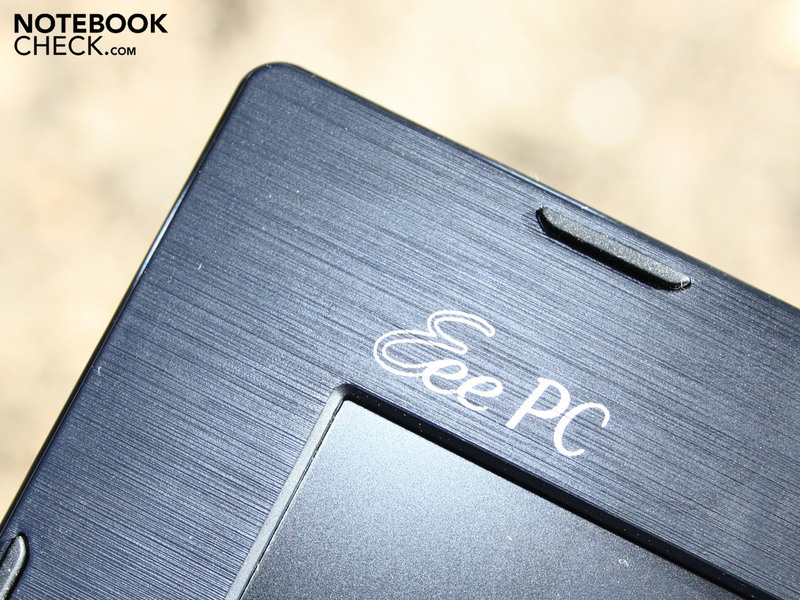 The Eee PC 1016P's Super Hybrid Engine allows switching (FN + space) amongst the various energy modes. The CPU only clocks with 999 MHz in power savings mode. Asus overclocks it to 1708 MHz (instead of 1660) in Super Performance Mode. Is that enough to see any kind of performance improvement? The N455 achieves 581 points in Cinebench R10's single-core test. N450 test devices (21 in data base) reach about 457 to 589 (partly @1710 MHz). Devices with and without slight overclocking share the entire range. The multi-core test of the same benchmarks finishes with 888 points. The comparison CPU achieves 819 to 938 points, whereas the highest rates are determined by non-overclocked N450s. All in all, the N455 and 450, with or without mini overclocking by the Super Hybrid Engine, are on the same low level. The question, if the two gigabytes of DDR3 RAM have a positive impact is much more interesting. 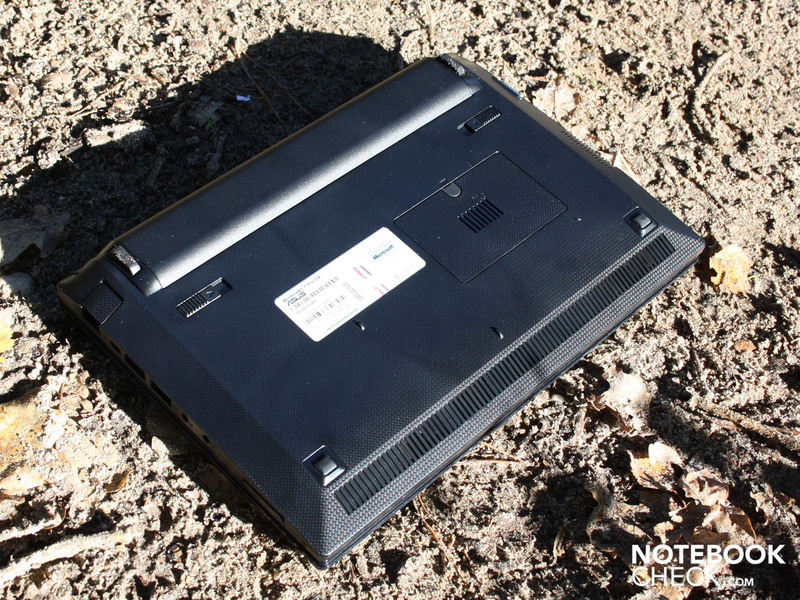 We have often reprimanded netbooks with Windows 7 Starter for their sluggish application performance in the past. Now Asus has even installed Windows 7 Professional with enabled Aero effects on its 1016P. Has the application performance perhaps increased measurably? PCMark Vantage finishes with 1230 points. The test displays the system performance as a combination of CPU, HDD and RAM performance. The result is poorer than that of a Samsung NP-N150 Eom with an N450 and DDR2. This could be due to the superior HDD in the N150. The memory scores of both devices are 434 (N55) and 428 (N450) points. Again, there is no difference. The older PCMark05 finishes with 1516 points. N450 systems are clearly defeated, depending on the overclocking. N450 @ 1660MHz achieve 1270 to 1355 points. It can be enough for 1426 points with a bit of overclocking on the N450 @ 1710 MHz. 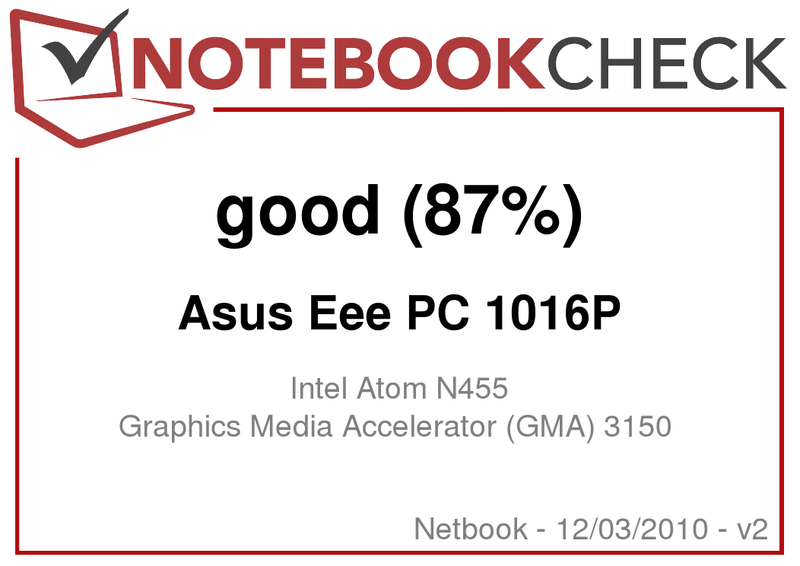 It's even enough for 1510 points in the 450 @ 1838 MHz (Asus Eee PC 1008P). 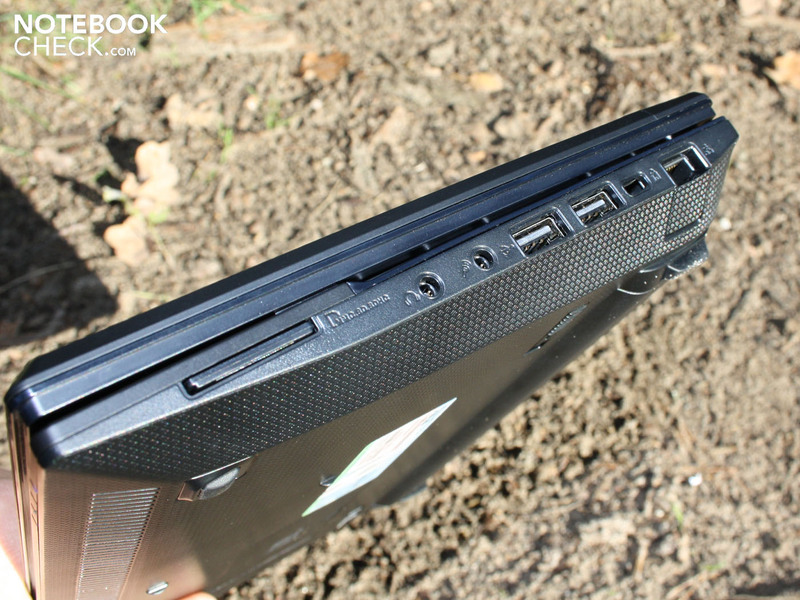 In short: Only PCMark05 presents an advantage of up to 16 percent for the DDR3 netbook. PCMark Vantage remains unimpressed, though. The experienced application performance under Windows 7 Professional (Aero effects on) isn't as poor as expected. 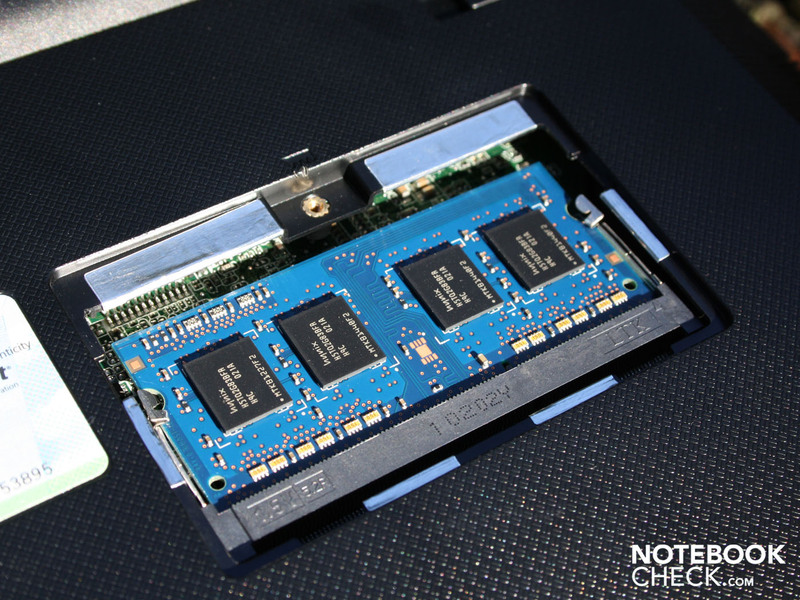 Subjectively, we admit that the DDR3 system works smoother than the N450 test devices of the past. Nevertheless, files, directories or new programs open with a slight up to evident delay. It gets really slow in battery operation in Power Saving Mode. If you now do more, so surf over several websites, you'll experience obvious delays in the workflow. We noticed that even single websites overfilled with flash banners load the processor permanently with 100% during the battery life test. The Pine Trail system doesn't have any reserves for further multitasking operations. 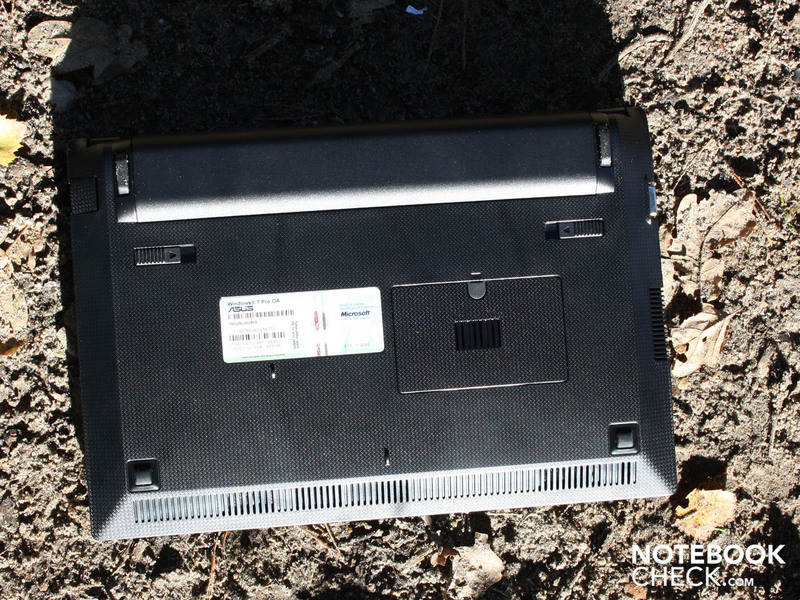 However, the low system performance is a matter of netbook nature. If you want an astronomical runtime, you'll have to be willing to accept compromises, or turn to a more expensive subnotebook. The Seagate hard disk (type: ST9250315AS) has a gross capacity of 250 GB, and reaches a burst rate of 61 MB/s in HD Tune (sequential read). That's less than the average of current 2.5 inch notebook HDDs. Merely the discreet clacking of the Seagate HDD is audible during intense activity of the read and write heads. 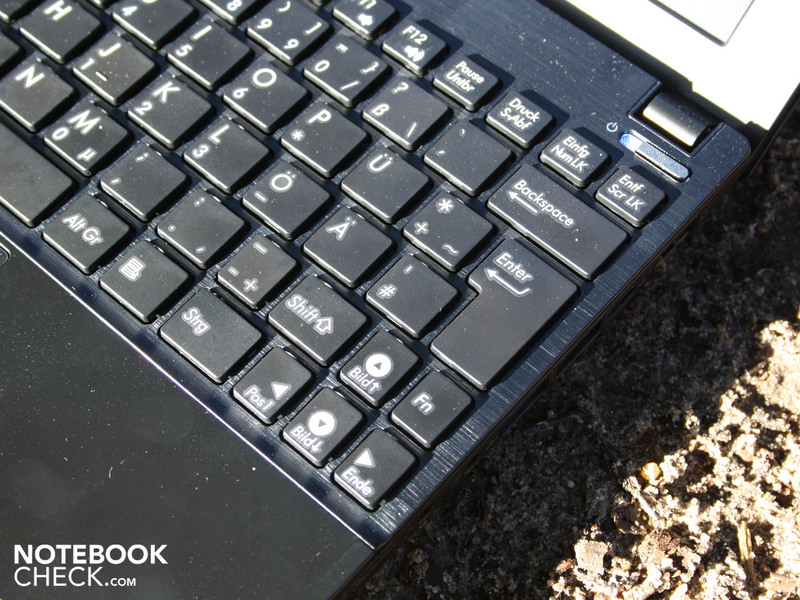 One of the positive features of the Asus Eee PC 1016P is its quiet noise level. There is naturally an active fan, but it's only minimally audible in normal use without constant load. We measured 31.2 dB(A) (idle) up to 34.5 dB(A) in this case. The latter turns up under short CPU load or a 3D benchmark. The system noise increases to a maximum of 36.4 dB(A) within a few minutes under constant processor load induced by the tool, Prime95. There, the noise stays constant and has a subtle, clear whistle characteristic. After ending the load, the fan reduces itself again to 34.5 dB(A) within 10 seconds. The rotating Seagate hard disk is always audible as a quiet whirring. A quiet clacking reveals the activity of the read and write heads. The waste heat can be categorized as equally harmless. In a fairly cool measuring environment, the bottom heats up to a maximum of 32.5 degrees Celsius selectively in idle (average: 28 degrees). The average temperature on the work surface is around 27.8 degrees during processor's idle. Once again, in comparison to the heat development under permanent load, an interesting effect sets in: The maximum and average temperatures sink under load. The reason: When the fan runs slowly or not at all, heat gathers in a few areas of the case. Then again, when the fan runs constantly, it seemingly emits the heat so effectively that the surface temperatures decrease. (+) The average temperature for the upper side under maximal load is 25.4 °C / 78 F, compared to the average of 29.8 °C / 86 F for the devices in the class Netbook. (+) The maximum temperature on the upper side is 28.3 °C / 83 F, compared to the average of 33 °C / 91 F, ranging from 21.6 to 53.2 °C for the class Netbook. (+) In idle usage, the average temperature for the upper side is 27.8 °C / 82 F, compared to the device average of 29.8 °C / 86 F.
(±) The average temperature of the palmrest area of similar devices was 29.3 °C / 84.7 F (+1.2 °C / 2.1 F). The 1016P's little stereo loudspeakers are located underneath the wrist-rest and throws its sound waves towards the table top. The sound is treble-prone. But it's at least stable, in the sense of scratch-free, at highest volume. The sound enhancements in the audio rendering properties don't have an impact on the sound quality (virtual surround). Merely the volume balance shows an effect. Demanding listeners will soon look around for headphones. The 3.5 millimeter audio jack on the right provides a clean, static-free output level (audio test only). The level isn't particularly high though. We even had to disable the volume balance in use with large headphones to achieve a sufficiently loud sound experience. The Asus Eee PC 1016P's runtimes are remarkable. The test device achieved a bit over 9.5 hours with maximum energy savings measures (idle). The 1016P was on during these 576 minutes, but inactive with disabled WLAN and minimum brightness (Power Saving Performance Mode). Such a runtime isn't nonrecurring (Eee PC 1001P: almost 11 hours), but it is achieved by a 6 cell battery with only 4400 mAh. Our test reconstructs the real battery life best by surfing via WLAN. The battery is first drained after 7:53 hours (473 minutes). We visited news sites, some with blinking flash banners, in this time. The LED screen ran on a luminosity of 100 cd/m2 during this test. The 3G test (EDGE connection) with a surf stick only lasted for 5:20 minutes. The settings were the same. WLAN and Bluetooth were however now disabled. A video clip (Windows Media File) from the hard disk helped us determine the "DVD runtime". The CPU was loaded to about 50% during the test. The clip came to an end after almost 6:16 hours (376 minutes). A constant 100% load results in a runtime of 4:42 hours (282 minutes) for the Atom N455. This scenario would be rendering a FullHD video clip, with the maximum brightness at the same time. The battery needs 2:44 hours till it's fully charged after such a sitting. The long battery life is due to a low power consumption, which only differs slightly between idle and maximum load. 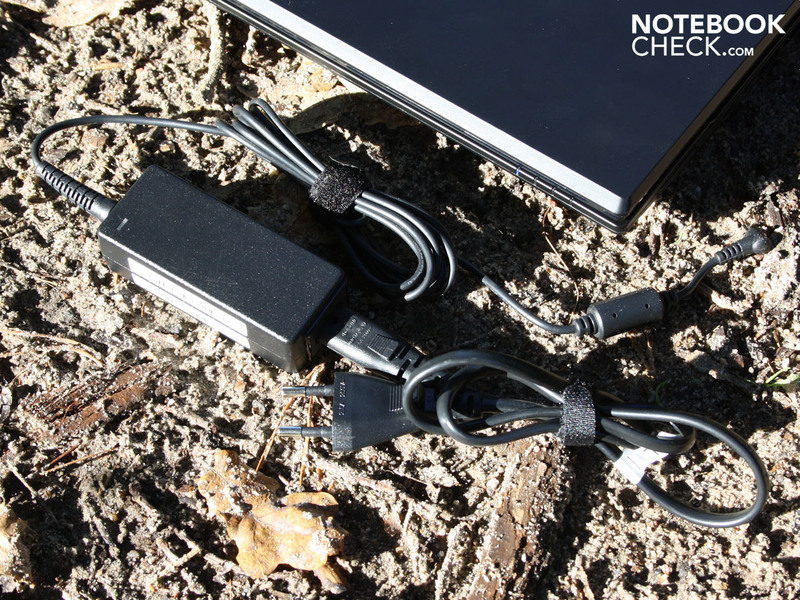 We assess 7.1 and 11.1 watts in idle mode (various energy modes, wireless on/off, brightness). If you challenge the 1016P and let the IGP graphics, as well as the CPU work, you can boost the energy requirement up to 15.1 watts. The battery was not inserted during the assessment in order to exclude charging. The very light adapter's power loss (187 grams including all cables) appears to be very low. Our multimeter only indicated 0.05 watts in a deactivated state without inserted battery. It's 0.5 watts in standby. 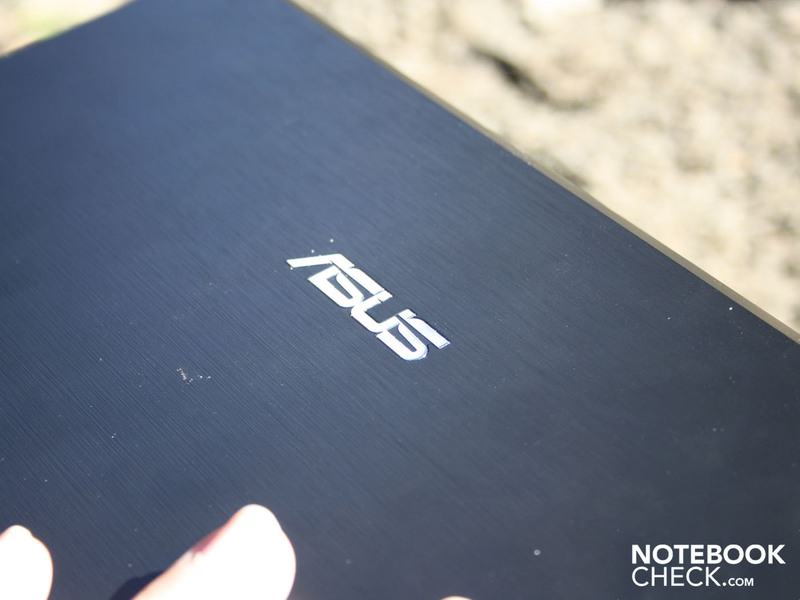 Asus' 1016P wants to belong to the netbook elite. However, it neither confirms this trait with a strong Atom performance, nor with a very good connectivity (no HSDPA module installed). Nevertheless, its specifications in terms of workmanship, ergonomics, battery life and display are worthy. The contrast rich (835:1), bright 250 cd/m2 and AR coated 10.1" display is outstanding. The WSVGA resolution may be too low, but it can be interpolated up to 1152x864 pixels, which increases the overview considerably. In terms of performance, the DDR3 system (2 GB) can compete unbiased with Windows 7 Business, whereas even Aero effects (translucent windows) were enabled. The real computing power of Atom N450 and N455 only differed within the limits of the measuring tolerance. Users should only load the 1016P with simple office applications and avoid executing multitasking. The lack of a HSDPA module for mobile surfing on the web is a real drawback. Such an outdoor suitable TFT, together with such a good battery life (surfing via EDGE: 5:20 hours) just simply has to be capable of 3G. 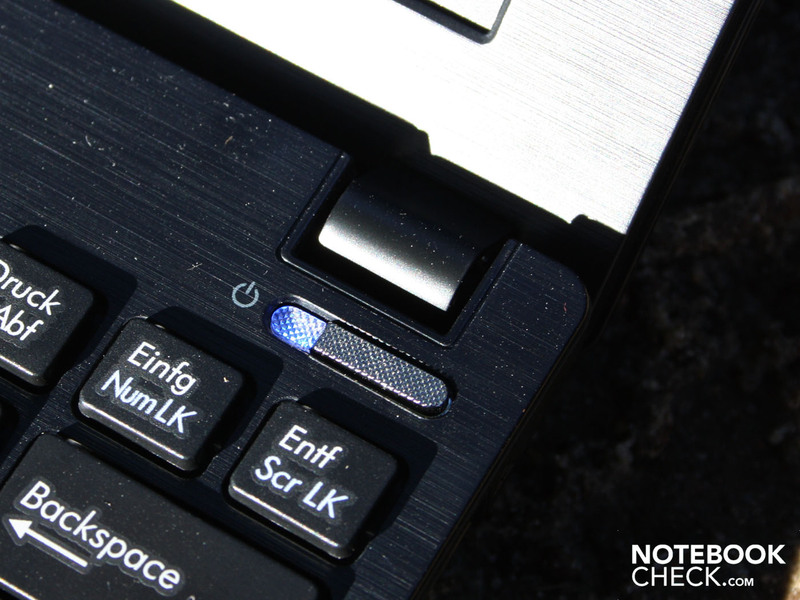 A downer of a different kind are the few tiny keys on the keyboard, as well as the touchpad key's poor feedback. 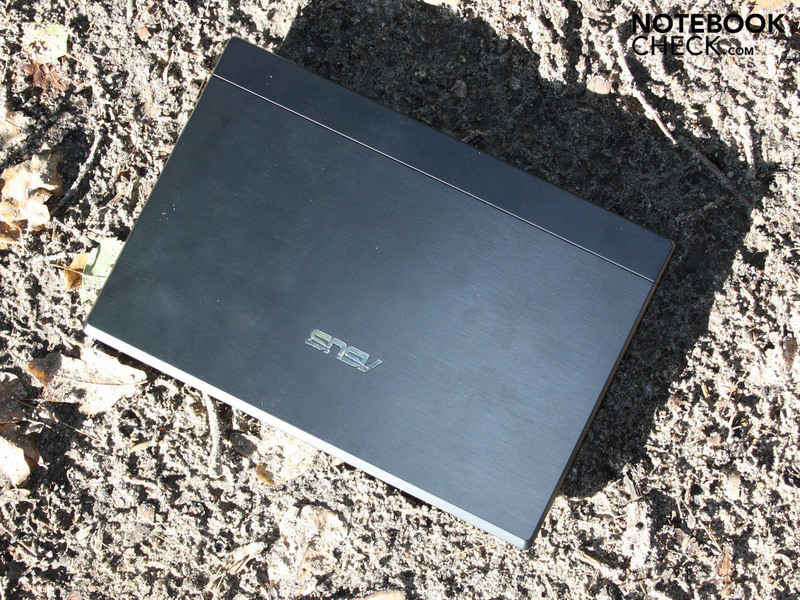 The Windows 7 Professional alternative of Asus' business netbook is priced at 429 euro (2 GB DDR3). This price is reasonable in view of Windows 7 Starter (1 GB DDR3), which costs 340 euro. 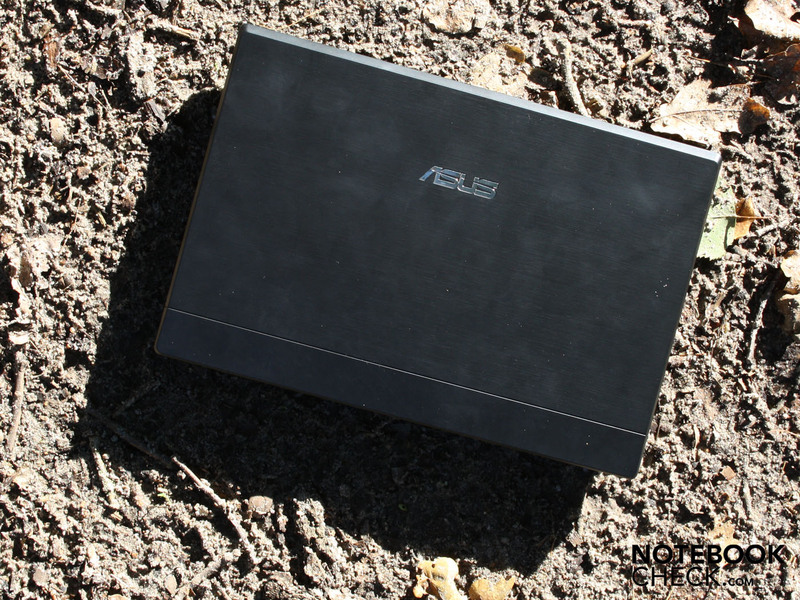 Asus has had big success with its mini notebooks in the past years. The detached keys have a good pressure point and firm stroke. This button enables/disables WLAN/Bluetooth. The second one switches to presentation mode. Aware users cover the webcam mechanically - and are thus protected against observation. 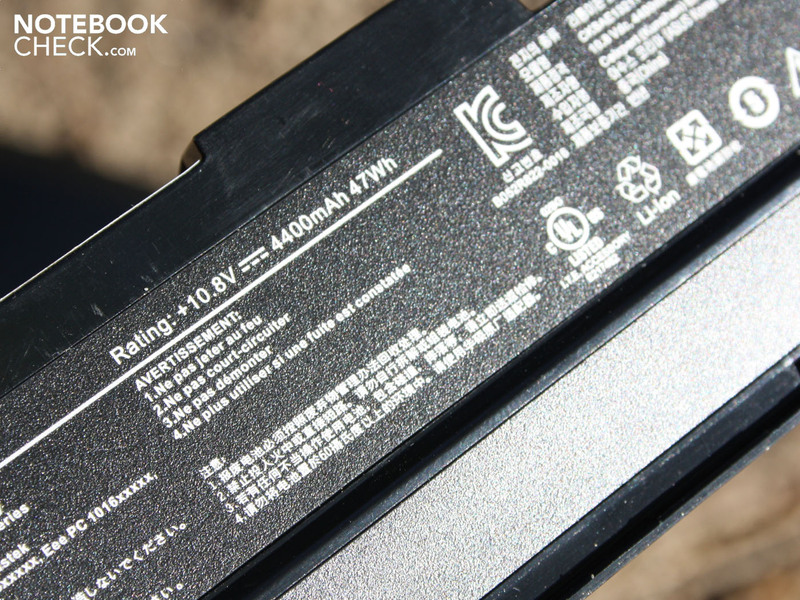 The firmly locked battery has a capacity of 47 watt hours. That is only 4400 mAh, but still enough for long battery runtimes. There is a preparation for a SimCard underneath the battery. A UMTS module is unfortunately not installed in the 1016P. The small adapter is very light with 187 grams including all cables. It supplies 40 watts and has a very low power dissipation. We can hardly twist the small case. alike 1152x864 pixels. More place for notebookcheck.com. The Eee PC family has reached such an enormous model variety. Even display PCs belong to this. and a solid 1.25 kilogram case. 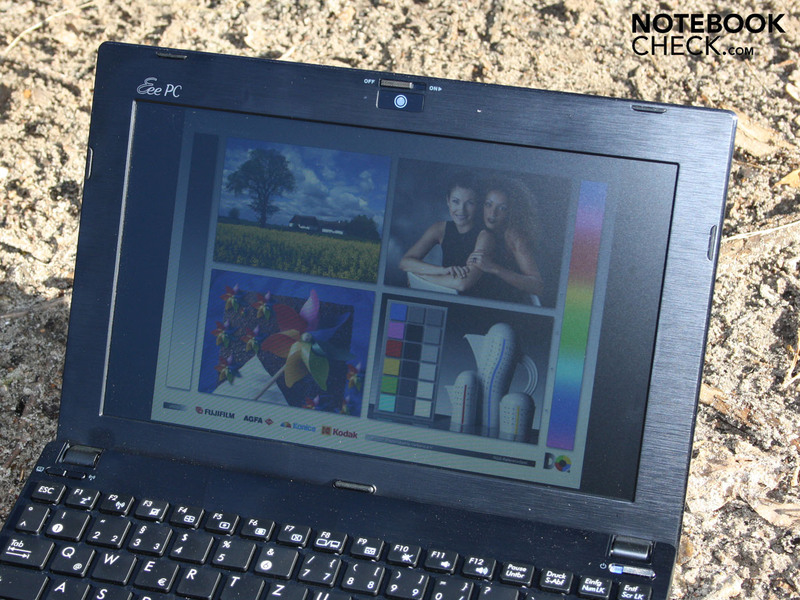 The Eee PC 1016P is equipped with an Intel Atom N455. of which 2048 MB are installed (bottom cover). The AR-coated 10.1 inch display is very bright and has generous horizontal viewing angles. ASUS Eee PC 1016P: 2 GB DDR3 but no UMTS module. Matt, contrast rich and bright - that's how an outdoor display has to be. 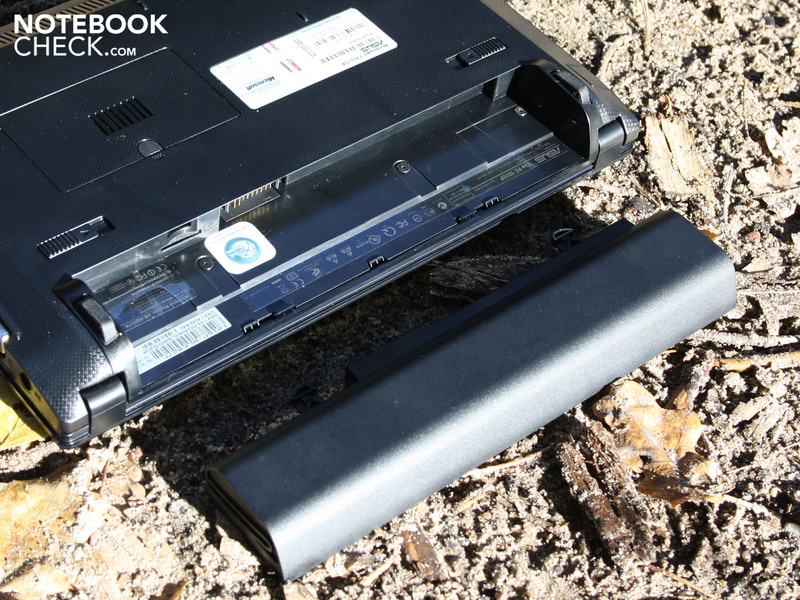 An incorporated HSDPA module is mandatory in such a runtime strong netbook. 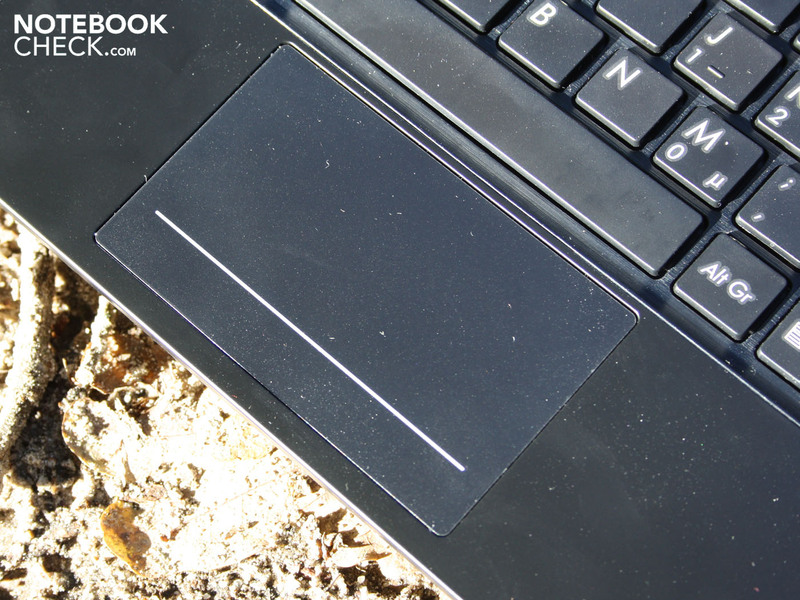 A fast-to-use touchpad, as in HP's ProBook or Elitebook. The battery runtimes are awesome. And that with a 47 watt hour battery and bright display.